Selective Mutism: A Guide for Therapists, Educators, and Parents provides an effective, research-based behavioral intervention plan for the successful treatment of Selective Mutism. Based on years of clinical experience and expertise, author Dr. Aimee Kotrba provides not only assessment and treatment information, but also case examples, easy-to-implement workbook sheets, and informative handouts. 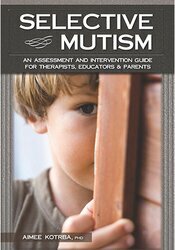 Dr. Kotrba is an advocate of team treatment - parents, schools, and mental health professionals working together to intervene with selective mutism -- and this book provides intervention strategies for all team members, as well as a comprehensive treatment plan that can be individualized to any child. The techniques included emphasize a gradual, stepwise approach to increased speech, as well as fun and engaging activities that can be used at each step of treatment. Tips for engaging and motivating children and teens are included to improve treatment outcomes. Aimee Kotrba, PhD, is a licensed clinical psychologist specializing in the expert assessment and treatment of Selective Mutism and Social Anxiety. She is the director of Thriving Minds Behavioral Clinic in Brighton, Michigan, a specialty clinic dedicated to effective treatment for children with Selective Mutism. Dr. Kotrba serves as the president of the Selective Mutism Group (SMG) Board of Directors and as the psychological expert for a local Selective Mutism parent support group. Dr. Kotrba's work has appeared in numerous media, including Parent Magazine and MetroParent Magazine.